In tech companies, getting people to grasp new ideas and ways of doing things is critical to the sales process. This got me wondering if I might be able to apply established teaching principles to the marketing videos we make for tech companies. I set out to explore some of the best blogs and websites from some of the top eLearning experts. What follows are tips and concepts that apply to marketing videos—tips you, too, should take into consideration in scripting and producing videos. The age of bite-size learning is upon us. In eLearning circles, there’s buzz about micro-videos and micro-learning—recommending six-second learning bursts, for example. People seem to learn best in short bursts—light bulb moments—better than they do by continuous effort. Concentration is hard to maintain in a world with so many competing demands on attention. We’re not sure how many light bulb moments can be crammed into a short video, but it certainly makes sense to have at least one and build the video around it. It might be something along the lines of “Look how easy it is to do X.” Regulatory compliance, for example, is generally seen as an important but uninspiring subject for a video. But if you can show how compliance processes speeds up customer onboarding, as we did in a video for a Canadian software company, light bulbs will go on. People naturally pay attention if they think they’re about to learn something practical to use right away. Most buyers, for example, are at least as interested in their own career advancement as they are in a marketer’s solution. They want to make a splash, but they don’t want to take risks. “Tell them, show them, let them do it” is a pretty standard eLearning approach that may apply. It is especially applicable in B2B content, where the problem you solve is the same problem your competitors solve. You don’t need to show the viewer why something matters. The “why” is the same for everyone—it’s the how that sets you apart. We like to build videos around practical demonstrations that venture into the weeds—talking to M&A attorneys about negotiation over indebtedness covenants, for example, or a real life scenario that quantifies the value proposition. Cognitive load theory holds that learning is a matter of processing information in “working memory” to fit existing patterns (schema) by which it can be stored in long-term memory. Our working memory is pretty limited, so it’s important not to overload it. If the intrinsic + extraneous + germane loads exceed the capacity of working memory, learning becomes very difficult. Obviously, a video producer can’t accurately measure or estimate these loads. However, according to eLearningIndustry.com, there are some best practices for reducing cognitive load that can be applied in video. 1. Present some information via the visual channel and some via the verbal (aural) channel. Video already does this, you’ll say. But the vast majority of marketing videos load all the complex information (the messaging) into the aural channel, and load up the visual channel with eye-catching extraneous information like talking characters and decorative graphics. These can make videos compelling and fun, but we should also recognize that they consume brainpower needed for learning. 2. Break content into smaller segments and allow the learner to control the pace. Short videos that teach in bite-size chunks. Videos that allow the user to process information effectively without taxing working memory. This is tricky in marketing videos because videos that fail to dazzle with motion, music, and other razzmatazz don’t feel like the videos that delight us most. The guiding principle in an eLearning context is that if content doesn’t support the instructional goal, it should be removed. In a marketing context, some professional pizzazz is expected, but we should at least keep in mind that dazzlement is not the goal. Introduce new learning using appropriate attention-grabbing techniques: a specific problem, a comparison, a memorable visual, a thought-provoking question, a clear contrast, a checklist. Tell viewers how what they’re about to learn applies. Discovery learning: Help viewers discover and become aware of what they already know. Show your relevance using real-life examples, contrasting examples with non-examples, case studies, and realistic scenarios. Use step graphics and tables to break down complex processes into steps to keep viewers engaged. Understand that in marketing videos, it’s usually more important to put across examples of what you can accomplish with a solution than it is to show how it’s done. But if you can come up with a series of software screens that tell a story and exemplify the concept, you can turn an abstract concept into something that feels like real life. Get prospects to take the next step with interactive videos, including calls-to-action, downloading a free trial, branching, quizzes, and even chapterizing your videos. Using eLearning insights can give you a competitive advantage. Explainer videos have become somewhat commoditized with stock cartoon characters and motion graphics. There is a competitive advantage in applying eLearning principles—the overwhelming majority of technology solution providers don’t. If you can come up with strategies that encourage people to learn what you want them to learn, you’ll be ahead of the game. Since 2004, Bruce McKenzie, founding partner of 2-Minute Explainer, has been developing videos that increase sales engagement for IBM, Cisco, Brocade, Quantum, Compuware and many B2B technology startups. 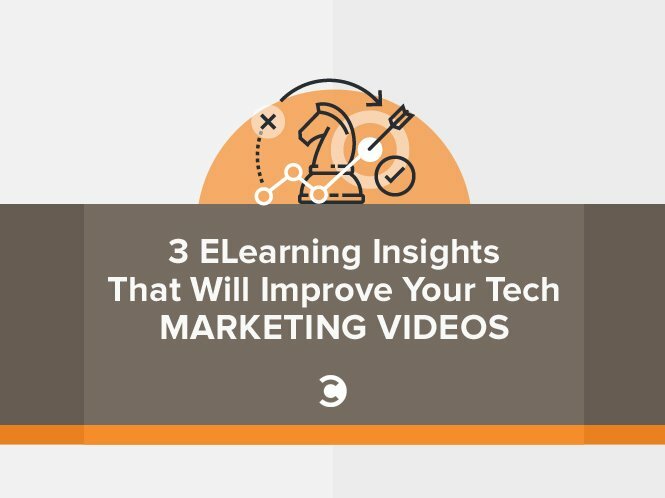 His free guide "Apply eLearning insights to improve your technology marketing videos” provides additional information to help you designing videos that engage IT buyers.